“Hogs,” [Harley Davidson], Hondas, hot women, hot weather and a whole lot of revved to the maximum fun–that’s Phuket Bike Week 8-10 April on Phuket. Some 6000 big bikes and 30,000 motorcycle fans make this South East Asia’s largest motorcycle event. Now in its 17th year and held just before the traditional Songkran festival on 13-15 April, Phuket Bike Week has a “Miss Bike Week” competition, kicks off with a grand dinner, has a motorbike exhibition, a “Miss Songkan Fun Fest” contest, fire dancing, Thai dancing, a custom bike and tatoo contest, a ride for peace and global warming, beach party and music festival at the football field, Loma Park, Patong Beach. The beach party and music festival will feature top local and some overseas artists. Motorbiking can be such fun! The Phuket population will be able to view the awesome sight of dozens–maybe hundreds–of dedicated bikers on their gleaming, lovingly cared for “hogs,” Hondas and every other type of bike imaginable, rumbling around the island to plant banana trees on their way. That’s one way of reducing the carbon footprint of all those bikes. Phuket Bike Week started in 1995 with a group of enthusiasts and attracted around 150 motorcycles. Riders from Thailand, Malaysia, Singapore, the United States and many other coutnries come to Phuket for the event. It attracts television coverage in Thailand and overseas. It is supported by companies like Harley Davidson, who have more than 300 community members in Thailand alone. Bike Week is organised by the Patong Municipality, Phuket Big Bike Lovers’ Club, Phuket Riders’ Club, the Heroine Club, Ride Thailand Magazine and the Tourism Authority of Thailand. A 400 cc Honda Steed Trike. Models at Nicky's Handlebar Hotel in Patong show what's hot at Phuket Bike Week 2011. PHUKET: The official festivities for Phuket Bike Week 2011 draw to a close in Patong tonight after another full day of big bike fun and games, live music and road trips around the island. At 4pm today, a convoy of riders will leave Loma Park on Patong Beach, the main rallying point and concert venue for Phuket Bike Week this year. The convoy will head south on a two-hour, 30-kilometer round trip to Phuket’s iconic peninsula Laem Phromthep, the southernmost point on the island, passing through Karon, Kata and Nai Harn en route. From 9pm to 10pm on the main stage will be the very popular Thai country music artist “Bowie”, famed throughout Southern Thailand. Bowie hails from Trang province and is probably best recognized in Phuket as the “thumbs-up” man on the Toyota Vigo billboard advertisement that stood at the northern end of the bypass road for months at the end of last year. After Bowie’s concert will be the final round of the Miss Phuket Bike Week 2011 from 10pm to 11pm. The three-day Bike Week official program will close with more live music from 11pm until midnight. All during the entertainment on stage, from 3pm through to midnight, a collection of big and other custom bikes will be on show at the football field across from Loma Park. With the official activities behind them, the riders will enjoy the next two days on road trips in and around Phuket. Expect many of the 6,000 or so riders to stay on the island for Songkran (Thai New Year), which starts on Wednesday. PHUKET: In a move that may alarm some but amuse others, going cheek to cheek with Bike Week on Phuket next month will be the Phuket Pride Festival. The move of Bike Week from April 6-8 to April 20-22 is believed to have been generated by restrictions on the sale of alcohol for a Phuket election and a Royal funeral. The switch in dates, announced today, puts the event adjacent to the Phuket Pride Festival 2012, which runs from April 23-28. Phuket's bikers, it must be said, are among the most tolerant people on the island. Bike Week usually attracts people from all over the world, especially Singapore and Malaysia. Activities usually extend from the official few days to a week or more. A bike show, beauty queen contest and tattoo festival are on the agenda this year. This year the tick list for bikers packing for Phuket might read: leather jacket: no problem. peacock feather headdress: why not? Phuket Pride 2012 is blossoming as a festival celebrating alternatives and this year for the first time will be marked not just in Patong but all over Phuiket. The Phuket Provincial Administrative Organisation election on April 7 will trigger a ban on alcohol sales across Phuket from 6pm on April 6 to midnight on April 7. Thailand's government has declared April 9 a special holiday to allow people to take part in the royal cremation of Her Royal Highness Princess Bejraratana Rajasuda at Sanam Luang. All entertainment venues have been asked to close as Thailand pays tribute from April 8-10. 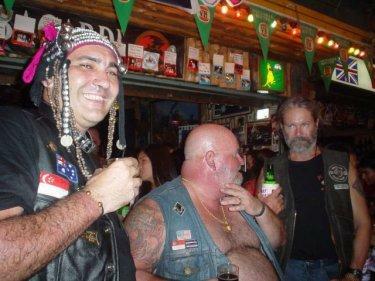 I always thought riding Harleys and the whole assless chaps fashion show was kinda gay anyway.